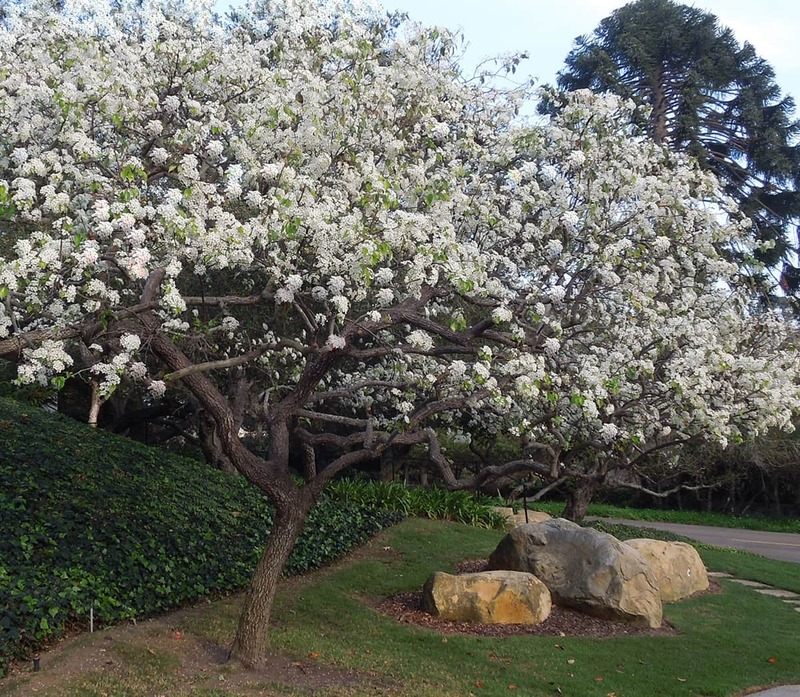 The Evergreen Pear tree produces an amazing output of blossoms in winter, when many other trees are quietly dormant. Because this lovely tree can be completely covered in white flowers and then its petals fall to cover the ground in drifts, it can even mimic a snowy winter! 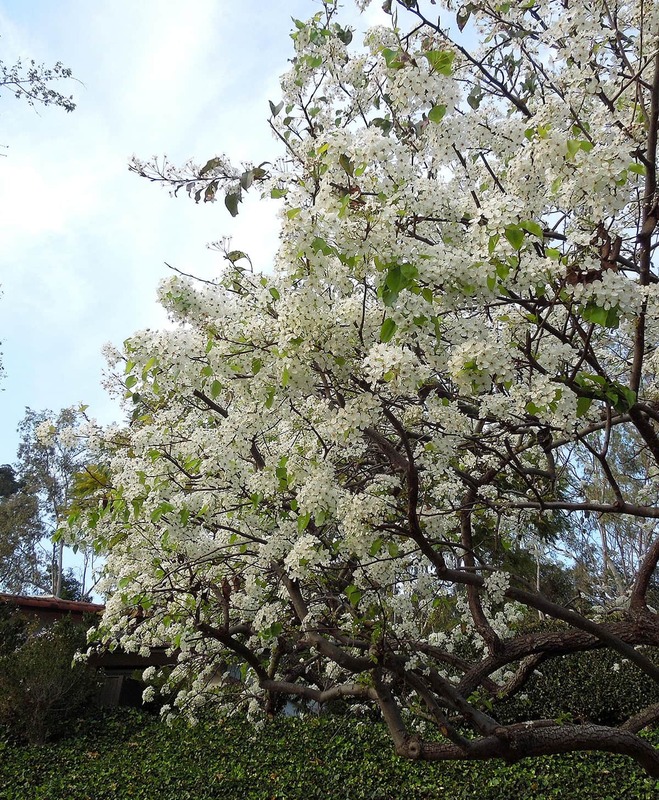 This tree’s beautiful display, plus its fine ability to adapt to a wide variety of soils and low water requirements, makes it a popular tree in Santa Barbara. Evergreen Pear is native to Taiwan, but seems to be quite happy here – and we are happy with it! It is commonly named “evergreen”, because it doesn’t have a long dormant period (like the common pear trees) and can retain its leaves all year. The leaves are a shiny, light green and often turn to a bright red and yellow in the late fall; the deeply furrowed bark is distinctive and interesting. Its botanical name is Pyrus kawakamii. “Pyrus” is the Latin word for fire, referring to the unfortunate susceptibility to fire blight disease. Fire blight, which causes intermittent limb die-back, can usually be controlled by pruning out the affected twigs. “Kawakamii”, honors the Japanese horticulturist who developed the variety. It is a small to midsized tree, which can grow to 30’ high with a spread of 20’. Its roots can fit into smaller spaces, so it makes a good street tree, garden tree, or patio tree. Evergreen pears can be seen all around town. The largest street plantings are in the 800 to 1800 blocks of Garden Street and the 900 to 1300 blocks of East Gutierrez Street. They can also be seen on Ferrara Way and Palermo Drive (in Hidden Valley), on Barranca Way (on the Mesa), and on Eileen Way and Lincolnwood Drive (in San Roque).